Hans Van Oosterwyck is a professor and the chair of the Biomechanics section (Mechanical Engineering Department) at KU Leuven, where he is heading the Mechanobiology and Tissue Engineering research group (www.mech.kuleuven.be/mechanobiology). He holds an MSc degree in Materials Engineering (1995) and a PhD degree in Engineering (2000), both obtained at KU Leuven. He has been a postdoctoral fellow at the AO Research Institute in 2004-2005 and a visiting scientist at the University of Zaragoza in 2009. He is a member of Prometheus, the Leuven R&D Division for Skeletal Tissue Engineering. In 2012 he was awarded an ERC Starting Grant on the role of cell-matrix interaction in angiogenesis (‘MAtrix: In silico and in vitro Models of Angiogenesis: unraveling the role of the extracellular matrix’). His research focuses on the importance of cell-matrix mechanical interactions and mass transport for blood vessel formation (angiogenesis) and its role in tissue regeneration. 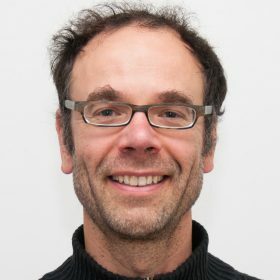 His group is strongly interdisciplinary, combines computational and experimental work, and currently involves 5 PhD students and 5 postdocs. Computational models relate to the use of mesh-based and meshless (particle-based, agent-based) methods and study cell-matrix mechanics and angiogenesis, and its relation to tissue regeneration. Experimental work aims at quantifying cell-matrix mechanics and solute transport, among others by means of optical microscopy imaging and image data analysis. Challenges relate to integrating computational and experimental data to generate novel understanding on cell-matrix mechanics and angiogenesis. 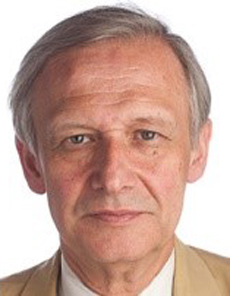 Hans Van Oosterwyck has been a Council Member of the European Society of Biomechanics (ESB) since 2006. He has been the President of the ESB between 2012-2014. Angiogenesis, the formation of new blood vessels from the existing vasculature, is a process that is fundamental to tissue and organ development, growth, repair and disease. Numerous studies have focused on the biochemical regulation of angiogenesis. In contrast, studies that target the mechanical regulation of angiogenesis are rare. In our group, we develop experimental and computational tools to quantify cell-matrix mechanical interactions and to investigate their importance for angiogenesis, both at the single cell scale as well as multicellular scale of an invading angiogenic sprout. Endothelial cells were cultured on soft polyacrylamide hydrogels of different stiffness values (1.4, 2.7, and 4.5kPa) and coated with different adhesion proteins (fibronectin or collagen). Cellular tractions were quantified by means of Traction Force Microscopy (TFM). Two spatiotemporal analysis methods were implemented and applied to the TFM data. A first analysis zooms into the acquired traction maps and define subsets of tractions associated with a local single peak of maximal traction, termed traction foci, in this way analyzing tractions at a subcellular scale close to the length scale of focal adhesion complexes. A second analysis clusters cells based on spatial distribution, magnitude, and temporal evolution of tractions at each time-point into distinct transient states. These states characterize cell mechanical behavior in terms of force polarization and strength. Traction foci were found to be larger in cells on collagen than on fibronectin, and stronger on stiffer hydrogels. The trends with which tractions increased with stiffness were different for foci and whole-cells, and depended on the adhesion protein used. Differences could be explained from the number of foci and their average strength. On fibronectin, a large number of short-lived weak foci were noticed, together being responsible for up to 30% to the total traction. Clustering analysis demonstrated that in all conditions, cell traction exertion is polarized, particularly on collagen. By looking into state transitions it was found that cells do not easily change simultaneously their force polarization and strength. Displacement fields around an angiogenic sprout that invades a collagen hydrogel were characterized in relation to sprout morphology and dynamics. Collagen displacement calculations were performed by means of a B-spline-based 3D non-rigid image registration process that warps the image of the deformed gel to the image of the relaxed gel. The latter was obtained by disrupting the cell’s actin cytoskeleton. We found that maximum displacements are of the order of 2 to 10 µms and are located at the sprout tips as well as sprout bases. Between bases and tips, traction-induced matrix displacements become negligible, suggesting that single sprouts mechanically behave as a force dipole along the sprout axis. By downregulating actin polymerization with cytochalasin D, displacement magnitudes were reduced, which also influenced sprout dynamics at different length scales: total sprout invasion length and individual sprout dynamics were reduced and sprout protrusions were found to retract. Two different models were implemented that capture a mechanically active cell in either a 2D or 3D environment, by using meshless, particle-based methods. A first model describes a three-dimensional cell on a planar substrate, and captures the dynamics of cell protrusion, adhesion and stress fiber formation by means of the discrete element method. A second model makes a 2D representation of a cell embedded in a viscoelastic, degradable extracellular matrix (ECM), modeled by means of smoothed particle hydrodynamics. Protrusions follow from local reduction of cortex stiffness and the application of small protrusive forces, and stabilized through adhesion formation. Curvature-dependent cortex contractility is implemented as well, leading to cellular tractions. Model sensitivity focused on the effect on traction polarization, morphology, and cellular traction magnitude of parameters accounting for protrusion, adhesion, actomyosin contraction, ECM stiffness, and ECM degradation. Simulations are compared to TFM experimental results. Results among others suggested that long-range deformations, as observed experimentally around invading sprouts, require collagen hydrogel to strain stiffen. 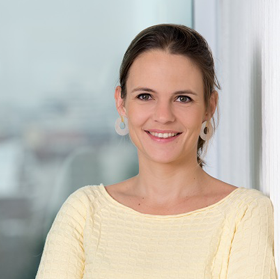 Lena Maier-Hein received a Diploma (2005) and PhD degree (2009) with distinction from Karlsruhe Institute of Technology and conducted her postdoctoral at the German Cancer Research Center (DKFZ) and at the Hamlyn Centre for Robotic Surgery at Imperial College London. During her time as junior group leader at the DKFZ (2011-2016), she finished her Habilitation (2013) at the University of Heidelberg. As DKFZ-Deutsches Krebsforschungszentrum in der Helmholtz-Gemeinschaft (German Cancer Research Center – www.dkfz.de) division head she is now working in the field of computer-assisted medical interventions with a recent focus on surgical data science and computational biophotonics. She is/has been (co-) principal investigator on a number of national and international grants including a European Research Council (ERC) starting grant 2015. Scientific awards include the Ingrid-zu-Solms Prize for natural sciences 2009/2010, the DFG Heinz Maier Leibnitz Prize 2013 and the Emil Salzer Prize 2016. Key challenges in interventional tumor diagnosis and therapy consist of the detection and discrimination of malignant tissue as well as the monitoring of tissue perfusion. While traditional approaches in the field of computer assisted surgery are typically based on multi-modal data fusion of intra-operative data with „offline“ pre-operative images, our concept focusses on optimizing the information acquired during surgery. Based on recent biophotonics techniques, including multispectral optical and optoacoustic imaging, as well as modern machine learning approaches, our methods allow for Augmented Reality visualization of a range of important morphological and functional tissue parameters, such as blood oxygenation, without relying on highly accurate deformable registration algorithms. The work to be presented in the talk has resulted from the European Research Council (ERC) starting grant COMBIOSCOPY – Computational Biophotonics in Endoscopic Cancer Diagnosis and Therapy. 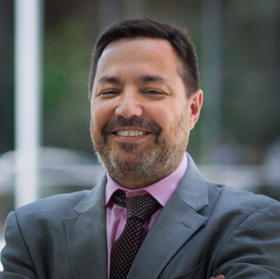 Paolo Bonato, Ph.D., serves as Director of the Motion Analysis Laboratory at Spaulding Rehabilitation Hospital, Boston MA. He is an Associate Professor in the Department of Physical Medicine and Rehabilitation, Harvard Medical School, Boston MA, an Adjunct Professor of Biomedical Engineering at the MGH Institute of Health Professions, Boston MA, an Associate Faculty Member at the Wyss Institute for Biologically Inspired Engineering, and an Adjunct Professor of Electrical and Computer Engineering at Northeastern University. He has held Adjunct Faculty positions at MIT, the University of Ireland Galway, and the University of Melbourne. His research work is focused on the development of rehabilitation technologies with special emphasis on wearable technology and robotics. Dr. Bonato served as the Founding Editor-in-Chief of Journal on NeuroEngineering and Rehabilitation. He serves as a Member of the Advisory Board of the IEEE Journal of Biomedical and Health Informatics and as Associate Editor of the IEEE Journal of Translational Engineering in Health and Medicine. Dr. Bonato served as an Elected Member of the IEEE Engineering in Medicine and Biology Society (EMBS) AdCom (2007-2010) and as President of the International Society of Electrophysiology and Kinesiology (2008-2010). Dr. Bonato served as Chair of the IEEE EMBS Technical Committee on Wearable Biomedical Sensors and Systems in 2008 and as founding member of this committee (2004-2012). He also served as Chair of the 33rd Annual International Conference of the IEEE EMBS (2011) and as Co-Chair of the 37th Annual International Conference of the IEEE EMBS (2015). He recently served as IEEE EMBS Vice President for Publications (2013-2016). He received the M.S. degree in electrical engineering from Politecnico di Torino, Turin, Italy in 1989 and the Ph.D. degree in biomedical engineering from Universita` di Roma “La Sapienza” in 1995. Dr. Bonato’s work has received about 7,000 citations (Google Scholar). Additional information about Dr. Bonato’s work can be found at www.srh-mal.net. Over the past decades, technology has gained a key role in neurorehabilitation. Our research team has focused its efforts on studying the potential use in neurorehabilitation of two technologies that we see as particularly relevant to the implementation of interventions, namely robotics (i.e., assistive devices and systems to retrain motor functions) and motion tracking technology (i.e., traditional camera-based motion analysis systems and recently developed wearable sensor-based systems). The goal of this lecture is to discuss the adoption of these technologies in neurorehabilitation and their potential role in identifying motor-phenotypes thus enabling the implementation of patient-specific interventions. First, we will present the results of recent research work focused on assessing the interaction between subjects and robotic systems designed for robot-assisted gait retraining. Such interaction can be studied by carrying out motor adaptation experiments in which the ability of subjects to generate a motor adaptation strategy in response to the forces produced by the robot is looked upon as a proxy of the ability of subjects to “learn from a robot”. We will then elaborate on the relationship between motor adaptations and the control of human movement as studied using traditional as well as wearable motion tracking systems. Specifically, we will review associations between the subject’s inability to generate motor adaptations and the biomechanics of motion, including the presence of physiological vs. aberrant muscle synergies. Finally, we will discuss the use of the above-mentioned approaches to identify motor-phenotypes in patients undergoing neurorehabilitation thus enabling the development of patient-specific interventions. 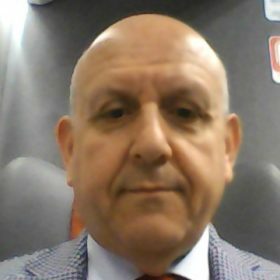 2017-Present: CEO of Gruppo ospedaliero San Donato-Irccs San Raffaele. San Raffaele Hospital is an international and highly specialized clinical-scientific-university structure for several major pathologies. 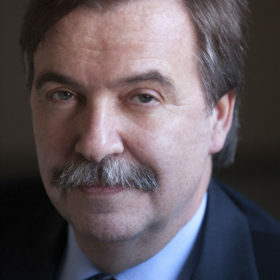 2004-Present: CEO of IRCCS Istituto Ortopedico Galeazzi in Milan-Italy. Leads the operations while balancing delivery of quality care with revenue growth and financial efficiencies. Responsible for the overall day to day hospital operations, drives, plans and leads the institution according to the mission given by the board, the NHS perimeter and the creation of value. Istituto Ortopedico Galeazzi is part of Gruppo ospedaliero San Donato, a private healthcare institution in Milan-Italy with 3 hospitals IRCCS Istituto Ortopedico Galeazzi, Istituto Clinico San Ambrogio e Istituto Clinico San Siro (186 milion euro revenues and 1773 employes and consultants). The institution is accreditated with the NHS and one of the Hospitals (IRCCS Istituto Ortopedico Galeazzi) is a leading and research hospital in the muskoloskeletal area. 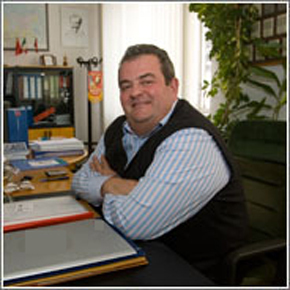 2000-2004 – General Manager of Istituto Ortopedico Galeazzi. Manages the administration of the facility throw planning and compliance of objectives. 1999-2000 – Market manager in Zimmer, leader company in orthopaedic devices. Responsible for the implementation of new marketing strategies designed to maximise revenue and extend the range of sales opportunities and business growth in orthopaedic market. Manages several key accounts (Hospitals and orthopaedic surgeons). Monitors and manages large marketing budgets. Responsible for the development and redditivity of orthopaedic devices lines (Hip, knee, trauma and spine). Responsible for managing the product throughout the product lifecycle, gathering and prioritizing product and customer requirements, defining the product vision, and working closely with senior managers to deliver winning products. 1991 – Bachelor in electronic engineering (Bioengineering) at Politecnico di Milano, Milan Italy. 2018-Present – Presidente di Biovalley Investments S.p.A.
2014-2017 – Chairman of TBS Group S.p.A.
1999 -2013 – Chairman and Chief Executive Officer of TBS Group S.p.A.
1996–1998 – Chief Executive Officer and Managing Director of TBS Group S.p.A.
1990-1992 – Director of the Planning Dept. of the Area Science Park of Trieste. 1975-1978 – Test engineer for a telecommunication multinational company (GTE, Milan). University Degree in Electronic Engineering, University of Trieste, Italy. Co-author of more than 40 publications and speaker at over 40 national and international workshops or symposiums. On the roll of the Society of Engineers of Trieste since 1975. 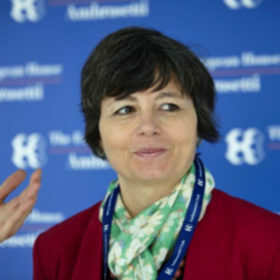 Maria Chiara Carrozza is an Italian Scientist and Member of the National Parliament, Chamber of Deputies, Foreign and European Affairs Committee. From 2007 to 2013 she served as Rector of Scuola Superiore Sant’Anna. In 2013, she was elected Member of the Italian Parliament. From April 28, 2013 until February 2014 she served as Italian Minister for Education and Research. She currently coordinates the NeuroRobotics Area of The Biorobotics Institute at Scuola Superiore Sant’Anna. Since 2016 she is President of the Italian National Group of Bioengineering. In 2016/17 she has been Chair of the Panel for the interim Evaluation of FET Flagships Program for the European Commission, DG Communication Networks, Content and Technology. She is Partner of the IUVO, a start-up in wearable robotics founded in 2015 as a spin off of The Biorobotics Institute. Since 2015 she serves in the Board of Directors of the Piaggio Spa group. Currently (from 1994) he is Professor in Biomedical Engineering at the Department of Electronics, Information and Bioengineering at the Politecnico in Milano, where he is also Chairman of the B-cube Laboratory (Biosignals, Bioimaging and Bioinformatics) in the same Department. From 1990 to 1994 he has been Professor of Biomedical Engineering at the Department of Computer and System Sciences of the University of Rome “La Sapienza”. He has been Chairman of the Bachelor Track (Diploma Universitario) in Biomedical Engineering of the Politecnico in the period 1996-2000. In the period 2000-2006 he has been Director of the Department of Bioengineering. In the period 2010-2012 he has been Chairman of the Programs of Biomedical Engineering (1st and 2nd level Degrees) at Politecnico. His research activity is mainly dedicated to various aspects of biomedical signal and data processing and modelling related to the cardiovascular system and in the field of neurosciences. He is the Author of more than 600 indexed international scientific contributions (about 300 on indexed scientific journals), according to ISI. His h-Index is 50 (ISI) or 63 (Google Scholar). He has coordinated various research projects at national and international levels in various topics of Biomedical Engineering and Bioinformatics. He spent over a year as a Visiting Professor at the MIT and Harvard School of Public Health, Boston MA, USA, as well as a period of 3 months at the Department of Physics of the IST (Instituto Superior Tecnico), Technical University in Lisbon, Portugal. He is Chairman of the Biomedical Engineering Group of Italian AEIT (Association of Electrical Engineering and Telecommunication). He is also Chairman of EMB18, Italian IEEE Chapter on Engineering in Medicine and Biology (EMB18). He is a Fellow member of IEEE, AIMBE and EAMBES and member of other international and national scientific associations. Since 2013 he is Member of the Ethical Committee of “Istituto Europeo di Oncologia (IEO)” and “Centro Cardiologico Monzino” in Milano, as well as of the Politecnico in Milano. In 2009 he received the IEEE-EMBS Academic Career Achievement Award. In 2010 he received the Milan Ambassador Award in recognition of his scientific activity finalized to the organization of important Conferences and initiatives in the Conference Center of the City of Milano. He is a Member of the Group of the best Italian Scientists (with h-Index ≥ 30). Daniela Corda is a cell biologist, Director of the Institute of Protein Biochemistry of the National Research Council (CNR) in Naples, Italy. She received her Degree in Biological Sciences from the University of Perugia, Italy and her Ph.D. in Life Sciences from the Weizmann Institute of Science, Rehovot, Israel. Her Post-doctorate was at the National Institute of Health, Bethesda, USA. 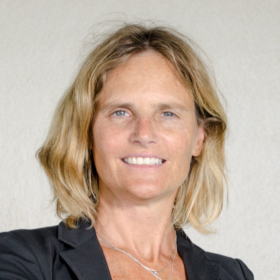 She has been working at the Consorzio Mario Negri Sud (Italy) as Group-Leader, Head of the Department of Cell Biology and Oncology and R&D Director until 2009, when she moved to the CNR in Naples. 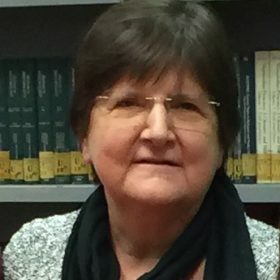 She is permanent member of the European Molecular Biology Organization (EMBO) and of the Academia Europaea, member of the Management Board of the Cluster Alisei, and served in several international advisory boards and selection committees (the European Research Council -ERC-, The Federation of the European Biochemical Societies -FEBS-, EMBO among others). Since 2015 she is member of the Advisory Board of AIRC (the Italian Association for Cancer Research). Daniela Corda’s scientific interests are in signal transduction and membrane lipid dynamics. Her laboratory has pioneered the field of protein ADP-ribosylation, and has identified the BARS protein and the components of the BARS-driven machinery leading to fission in membrane traffic and in Golgi complex partitioning during the cell cycle. Her findings have led to the identification of novel targets and small molecules to be developed in the pipeline for anti-cancer therapy. Since 1998 DC has been also active in science policy focusing on career development and on gender-related issues within European organizations such as the European Life Scientist Organisation (ELSO), the EC Marie Curie Programme, FEBS, EMBO. She is a member of the genSET Science Leaders Panel. She is now the Delegate of Italy in Horizon 2020 (ERC, MSCA, FET Configurations) of the European Commission and is the CoChair of the Board of Funders for the FLAGERA program (FET-H2020). Ugo Della Croce received his M.S. degree in electrical engineering from “La Sapienza” University in Rome in 1992 and his Ph.D. in bioengineering from the University of Bologna in 1996. He is a full Professor at the University of Sassari, Italy. Currently, he serves as Scientific Attaché at the Embassy of Italy in the United States of America. His research focuses on a) the development of methods to improve quantitative human movement measurements based on various sensing technologies including video, dynamometry and inertial sensing; b) clinical applications of human movement analysis, including studies regarding elderly, patients with Parkinson disease, multiple sclerosis, burns, chorea, stroke; c) the development and validation of technology (prosthetics, orthoses, exoskeletons) and protocols for motor rehabilitation programs (treadmill, robotics and/or Virtual Reality based). He has authored or co-authored over 100 scientific papers published in reviewed journals and presented at international conferences and held dozens invited lectures and seminars in the field of analysis of human movement in various European and North American Institutions. 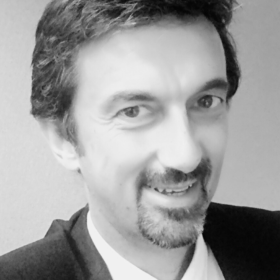 Fabrizio Landi, Founder, Panakes Partners SGR S.p.A. Graduated in bio-engineering at the Polytechnic of Milan. 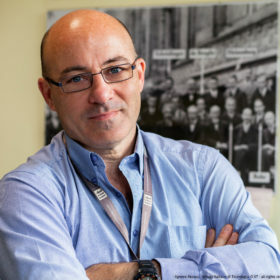 In 1979 Fabrizio Landi starts his professional career as Marketing Manager Engineer of the Life Science Instruments Department at Miles Italiana, a Bayer Group company. In 1981 he moves to the Ansaldo Group in Genoa, where he had responsibility for the Strategic Marketing Plan for the biomedical project, which later become Esaote spa. Since then and up to January 2013, Fabrizio Landi has been one of the members of the Esaote management up to become in 2006 Group Managing Director & General Manager and managing over his tenure, an IPO at Milan Stock Exchange and three Buyouts. In January 2013 he left Esaote to pursue other personal strategic initiatives. Besides many other offices he was appointed to as President and/or General Manager in the many Esaote Group subsidiaries and he was also a Board of Director in various North-American and Asian companies specialised in medical high tech. Presently he is member of the Board of Directors of Menarini Diagnostics, Firma and Silicon Biosystem all part of Menarini Group (the major Pharma Italian company). Since April 2012 he is also member of the Board of the CRF Bank, the center Italy sub-holding of Intesasanpaolo Bank (the major Italian Bank). Since May 2014 he is member of the Board of Directors of Leonardo/Finmeccanica, the major Air/Space/Defence and technological Group in Italy. 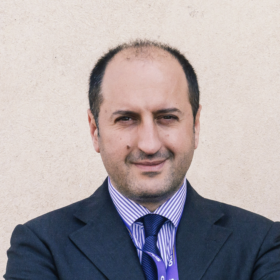 Since May 2014 he is President of Toscana Life Science, a technological biotech accelerator and Life Sciences promotion Foundation based in Siena and member of the Board of the Life Sciences Tuscany Regional District. In 2015 he has been the founder of Panakes Partners SGR Spa, an investment company focused to Venture Capital in Life Sciences market that since 2016 managed Panakes Fund a V/C fund targeting MedTech investments. He has different positions in both Confindustria nazionale and Confindustria Firenze. He still contributes to several university and post-university courses on biomedical engineering, health and company management. Born in Castellaneta (TA) May 29th, 1971. Graduated in Computer Engineering (Bioengineering). He worked at the Clinical Engineering Department of the San Matteo Teaching Hospital in Pavia (Italy). He currently works at the Technology Assessment Unit and Clinical Engineering at the A. Gemelli Teaching Hospital in Rome. He’s worked for the project “Establishment of an experimental center for Health Technology Assessment HTA” (development, testing and evaluation of biomedical technology and health care) financed by the Ministry of Health (ex art. 12), at the Engineering Unit of the Hospital Clinic San Matteo in Pavia, Hospital of Bolzano. Expert in Health Technology Assessment (HTA ) and Clinical Engineering. Founding Member of the Italian Society of Health Technology Assessment (SIHTA). He is currently President of the Italian Association of Clinical Engineers (AIIC). Assistant Professor at the Catholic University. Professor of Clinical Engineering and HTA, with particular reference to the Schedule of Investments, in the main postgraduate courses in the health sector (Catholic University, LUISS, University of Pisa, University of Siena, Milan Polytechnic, Sole24ore). Guest speaker at national and international conferences as an expert of evaluation of health technologies and clinical engineering. Member of the Commission of Bioengineering Order of Engineers of the Province of Rome. Author of several publications on scientific journals. From 15.7.2017 to current day: Trade union FEDIR national vice secretary. FEDIR is a federation that represents public management belonging to administrative, technical and professional payroll. About 2,000 members. Job position is performed through a full-time union detachment. Headquarters: Rome/Milan. From 1.1.2016.1 to 14.7.2017: Human resources manager. Melegnano and Martesana Public Hospital about 3,000 employees. Job description: recruitment, development, evaluation, trade unions relations, high and middle management careers, internal communication, company climate and employees satisfaction, etc. Headquarters: Vizzolo Predabissi (Milan). From 1.3.1999 to 31.12.2005: Human resources management, Lombardy region. Human resources policies for regional system and regional public health system. About 100,000 employees. Headquarters: Milan. From 1992 to 1999: Administrative coordination in leading private health. From 2012 to 2015: Master’s degree in Business economics at Private University in Castellanza (Va). From 1977 to 1983: Master’s degree in Philosophy at Padua State University. From 2004 to current day: Several specialisation courses in Management, Administration, budgeting and control. More than hundred contracts and tenures with Regional Educational Institutes and private and public Universities, concerning organisation and human resources, management, evaluation, national collective agreements, communication and relationships, etc. From 2006 to 2017: President and Member of external evaluation units in public Institutions, e.g. Niguarda Hospital (Milan), St. Gerardo Hospital (Monza), Poma Hospital (Mantova), Arzignano local health company (Vicenza). President and Chief Executive Officer of 1MED SA and Chief Executive Officer 1LAB SA. Contract Professor of “Regulatory Affairs” at University of Pavia, Faculty of Engineering. 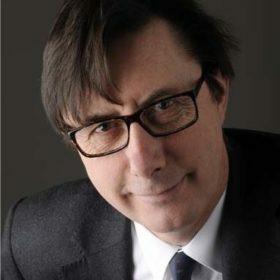 In 2013 he founded Atricath S.p.A., an innovative start-up company focused on the development of atrial fibrillation catheter-based solutions, and raised a seeding investment from private investors and Venture Capital companies and was also appointed contract professor of “Regulatory Affairs” at University of Pavia, Faculty of Engineering. At the end of 2014 he moved to Switzerland and in 2016 he joined 1MED SA, a regulatory consulting company and contract research organization and co-founded 1LAB SA, a tissue engineering start-up dedicated to the creation of new in-vitro models for preclinical testing of drugs and medical devices. Previously he covered the position of product manager in Piezosurgery srl, technical director at Anthen Ltd., executive regulatory affairs and quality assurance manager in Meditrial srl, Medical Device Technical Director in Eudax srl. Enrico Perfler actively participates to regulatory work groups. In particular from 2011 to 2014 he was in the panel of experts of the International Organization for Standardization ISO/TC 194 for the biological evaluation of medical devices – WG17 Nanomaterials and he was member of the Medical Device Technical Committees of UNI (Italian Organization for Standardization) Commission U4201 “Non Active Medical Devices – Biological Evaluation” and Commission U4205 “Surgical Implants”. From 2012 he is member of AFI – Pharmaceutical Industry Association – WG “Medical Device”. Education: Biomedical Engineering studies at the University of Genova. Master Degree in 2003. Career: Enrico Perfler is a serial Entrepreneur that has founded and managed several medtech start-up companies. He is also author of two internationally granted patents for atrial fibrillation treatment describing catheter based solutions. 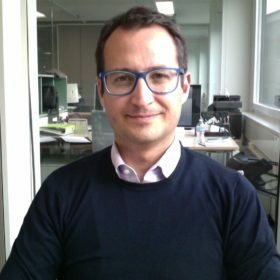 Riccardo Pietrabissa is Professor of Bioengineering at Politecnico di Milano (I) where he teaches “Endoprosthesis Design” and “Patent and Intellectual Property”. From 2006 to 2010 he has been Vice Rector at the Lecco Campus of Politecnico di Milano. He has been President of the GNB (National Group of Bioengineering) from 2010 to 2016. His main research activities have been addressed to biomechanics, biomaterials and prostheses, both using experimental and numerical methods. In 2001 he established the Technology Transfer Office of the Politecnico di Milano. In 2002 he was among the founders of the Italian Network for Technology Transfer (Netval) and its President till 2013. He won the Bridge Award 2009, awarded to an individual who has done the most to promote policies for entrepreneurship in university or public research institutions and the Italian 2016 Research Transfer Award.